GL Series - G & W Machinery Sales, Inc. The Vytek Laser GL series is a self standing compact and integrated laser system designed as a class 4 device or with an optional enclosure. The GL series is often chosen when a specific marking or small field cutting use is required to fit in a production environment. The GL is also portable system so it can serve as a mobile marking or cutting system through out your production environment. 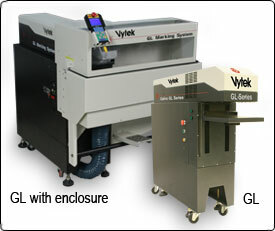 A Vytek representative can assist you to determine if the GL is a good fit for your organization. The GL series is available in both fiber laser (1070nm) and CO2 (10.6nm) laser configurations, the GL Series offers the power and flexibility to mark metals, plastics, glass, ceramics, textiles, wood, and other materials.